At CDS, our mission is to deliver a level of quality service that continuously exceeds customer expectations, which we strive for by committing ourselves to becoming a “5S” culture. 5S is the name of a workplace organization method that uses a list of five Japanese words: seiri, seiton, seiso, seiketsu, and shitsuke. These words describe a process of organizing a work environment in a way that fosters efficiency and order, thereby leading to higher quality output and an improved bottom line. Hewlett-Packard, Harley-Davidson, and Toyota are three well-known examples of companies that have also used the 5S process in order to engage employees and contribute to a culture of positive change. • Sorting— the practice of tidying and separating unnecessary items in the work area to prepare the area for an initial cleaning. • Simplifying—a place for everything and everything in its place, clean and ready for use. Simplifying arranges the workplace to ensure safety and efficiency. • Systematic Cleaning—cleaning for inspection. Systematic daily cleaning and inspection of work areas and equipment helps us understand current conditions and determine if corrective action is required. • Standardizing—developing standards for control and consistency. Everyone in the facility knows exactly what his or her duties are. • Sustaining—maintaining discipline and keeping the facility in safe and efficient order, day in and day out. By sustaining a “5S” culture, CDS continually strives to improve processes, ultimately leading to improved efficiencies, lower accident rates, and better equipment reliability. We are committed to being focused in our approach to safety, quality, customer service and continuous improvement. It isn’t just who we are; it’s what we do. 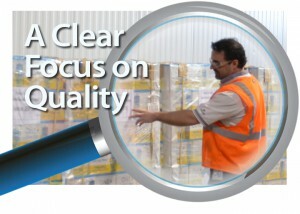 Focus on Quality – just one more example of CDS delivering EXCELLENCE IN EVERY CASE®.